Members in Sola Gratia Farm will receive fresh, seasonal vegetables from the farm for the Spring 4-week (SOLD OUT! ), Summer/fall 20-week or Late Fall 4-week growing season. We will be growing 125 varieties of over 50 different crops this year. All crops grown following organic methods. Produce is distributed each week at the farm. 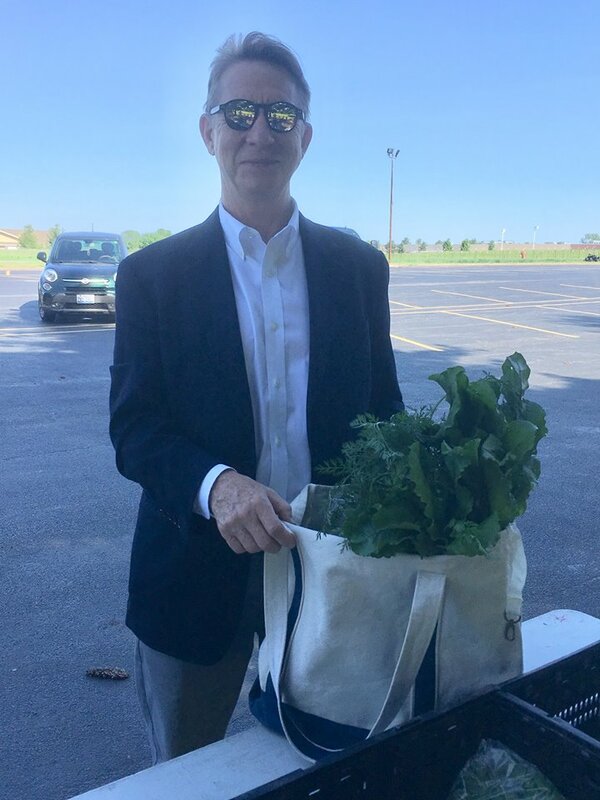 Pickups are either on Tuesdays at the Champaign Farmers Market between 3-6p, on Thursdays at the farm in Urbana from 4-6p or delivery is available for an extra fee. A bread share is also available from Rick's Bakery for $100 for 20 weeks as well as bi-weekly mushroom shares for $100 from Flyway Family Farm over the 20 week season. Flower shares from Delight Flower Farm are available for $200 for 10 weeks or $300 for 15 weeks. Sustainably raised meat and eggs purchased from Bane's Family Meats and honey from Second Nature Honey can be coordinated for same-day pick up from our farm. Fruit from local farm will also be available for purchase most weeks at pickups. Spring Share, 4 weeks in May/June - SOLD OUT!! Sola Gratia Farm produce is also available at Urbana's Market on the Square, Champaign's Tuesday Market, and Common Ground Food Co-op. Our vegetables are currently served at Red Herring Vegetarian Restaurant, The Wheelhouse, Dancing Dog Vegan Eatery, DISH Catering, and Piato's Cafe, Catering and Organic Food Nanny.